Since their inception in 2010, ACCESS Food Share Gardens have contributed over 370,000 pounds of organically grown produce to the ACCESS network of 50 emergency and supplemental food pantries, meal sites and other distribution sites in Jackson County of southern Oregon. 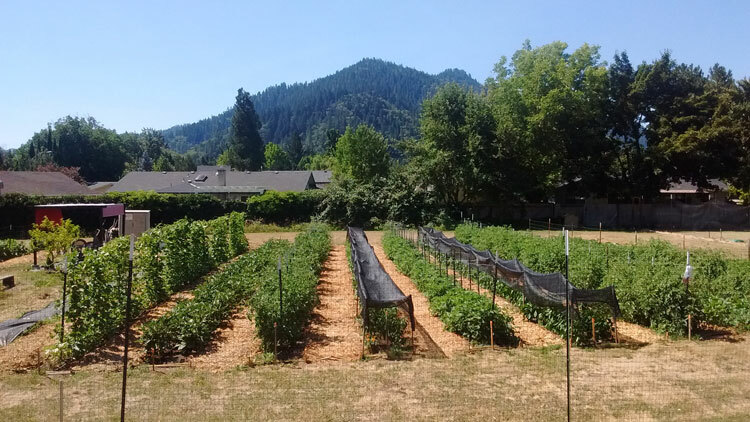 With the help of a grant from the Schwemm Family Foundation in 2017, ACCESS was able to develop partnerships with new land hosts in Gold Hill and Rogue River, Oregon after their long-term garden sites in both communities changed ownership last year. ACCESS quickly forged relationships with a church/charter school in Rogue River and Moose Lodge #178 in Gold Hill and were able to develop two new productive garden sites in time for the 2017 growing season. Infrastructure development at the new sites was a primary focus at the beginning of the 2017 season. Both sites received new eight-foot deer fencing, irrigation system upgrades, soil amendments and newly-designed post-harvest processing stations. In spite of the late spring rains and the heavy smoke this summer, production was excellent at both sites, improving from the previous sites with a 25% increase in pounds per square foot in Rogue River and a 50% increase in pounds per square foot in Gold Hill. The SFF supports the efforts of ACCESS in working to make fresh, local food more available to the communities of SW Oregon.